Static IP address. The WAN (and LAN probably) address should be static. DNS records. An MX record and some kind of mail.domain.com type of record should definitely be configured for the DNS servers that are authoritative for the domain. There should also be reverse records for the address of the server, usually created by the Internet Services Provider, or ISP, that match that record. Check the RBLs. If you have a new IP address you’ll be putting a DNS server on, check all the major Realtime BlackLists to make sure that some evil spammer hasn’t squatted on the IP before you got to it. This is true whether you’re in a colo, hosted on an IP you own or moving into space formerly occupied by a very standup company. A lot of IP addresses are blocked, as are blocks of IPs, so before moving mail to an IP, check it. Mail filtration (message hygiene). OS X Server has a number of mail filters built in, including clam for viruses, the ability to leverage RBLs, block specific addresses and of course RBL checking. However, this is often not enough. Third party services such as MXLogic help to keep mail from coming into your network. You also end up with an external IP to send mail that can cache mail in the event the server is down and keep mail off your network in the event that it’s spam. 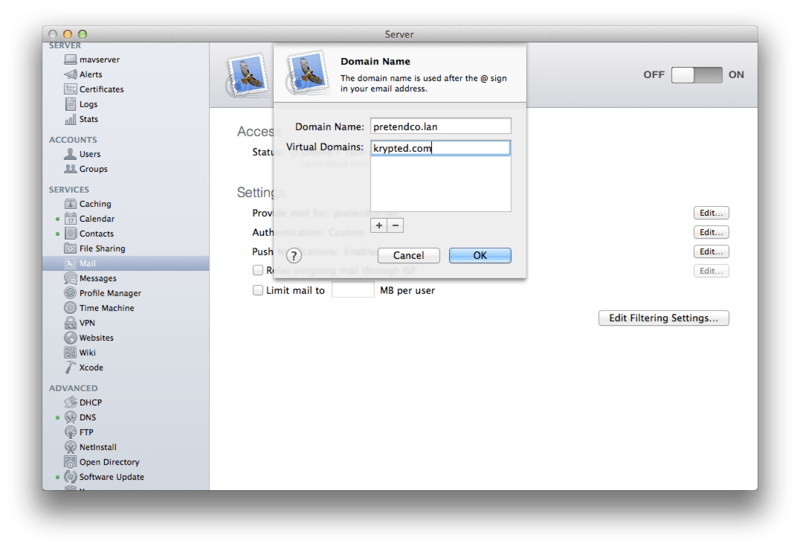 Provide mail for: Configures all of the domains the mail server will listen for mail for. Each account on the server has a short name and each domain name will be available for each short name. For example, an account with a shortname of charles will be available for email addresses of charles@pretendco.com and charles@krypted.com per the Domain Name listing below. Authentication: Click Edit for a list of sources that accounts can authenticate against (e.g. Active Directory, Open Directory, Custom, Local, etc) and in some cases the specific password algorithms used for mail. Push Notifications: If Push is configured previously there’s no need to use this option. Otherwise, use your institutional APNS account to configure Push Notifications. Relay outgoing mail through ISP: Provide a server that all mail will get routed through from the server. For example, this might be an account with your Internet Services Provider (ISP), an account on an appliance that you own (such as a Barracuda) or with an external filtering service (such as MXLogic). Limit mail to: Configure the total amount of mail a user can have in the mail store, in Megabytes. Edit Filtering Settings: Configure antivirus, spam assassin and junk mail filters. The “Enable virus filtering” checkbox enables clam. The “Enable blacklist filtering” checks the RBL (or RBLs) of your choice to check whether a given server is a “known” spammer and the “Enable junk mail filtering” option enables spam assassin on the host, configuring it to block based on a score as selected using the slider. There used to be a GUI configurable option several versions ago to enable a copy of all email received by the email server be sent to a specific email address. Is this option still available in Mavericks? You’d also need to configure the postmaster_address option as well. 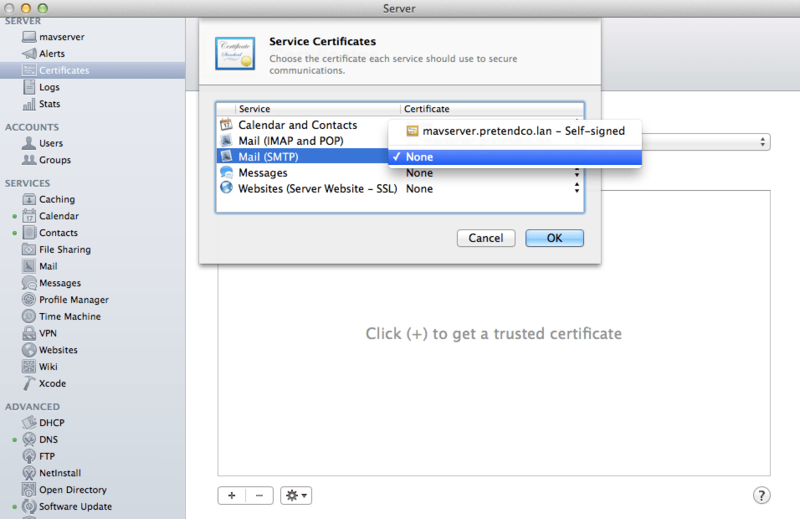 Have you (or anyone) worked out how to add procmail to the OS X server setup?